If you are looking for a hypoallergenic dog breed list for people with dog allergies or who want non-shedding dogs, you have come to the right place! I have gathered a thorough list of hypoallergenic dogs with pictures, so you can find just the right pet for you! Our list includes big dogs that don’t shed, non-shedding medium dogs and small hypoallergenic dogs. Choosing just the right dog for your family is a very important decision, especially if a family member has pet allergies. What Causes Dog Allergies In Humans? While all dogs have dander and saliva and go to the toilet, it seems the biggest allergen that causes most issues for allergy sufferers is pet dander – the fine, flaky dead skin cells that dogs shed. Dander is released in greater proportions from dogs that shed a lot. It can get into the air, causing problems for allergy sufferers. 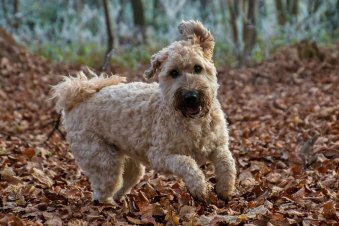 While there is actually no dog that is truly a “hypoallergenic dog”, there are certainly some breeds of dog that cause less problems for people with allergies. Hypoallergenic dogs are dog breeds that don’t shed much or they are hairless. Dogs with hair that continuously grows and is low shedding have the benefit of trapping the dander in their coats, so it’s not released into the air so easily. Dogs that shed often drop both their fur and the allergy-causing dander that is attached to that fur. That’s why their dog dander tends to cause problems for allergy sufferers. So, while all dogs have dander, hypoallergenic dogs tend to release less dander into the atmosphere because the dander is held in their fur. Keeping your dog’s coat well groomed (brushing them outside of the house, of course! ), washing your dog often with a gentle shampoo, and keeping the house clean can further reduce the effects of dander from your dog. This will be most effective for people with mild allergies. For people with severe allergies, it’s important to note that even allergy-friendly dogs can collect allergens in their coats when they are outside – pollen, pollutants and of course, they may come into contact with other dogs when they are out exercising. So make sure you are aware of the triggers for your allergies and choose your dog wisely, for the best outcome for both you and your dog. If all is going well, take it home on a trial basis, to see how you go for a week or two. If after this time, you are breathing easy, you can be fairly confident you have found a non-shedding dog that is also hypoallergenic for you! I have compiled a thorough hypoallergenic dog list to help you choose the best hypoallergenic dog for you. To further assist you, they are in alphabetical order and I have noted whether they are small, medium or large dog breeds. Please check back here regularly – I will be adding details of all the dogs in this list to this site. If I have missed a hypoallergenic dog breed, please contact me, and I will add it to this list! The Affenpinscher is a small, intelligent, hypoallergenic dog breed. Originally bred as a ratter, this high energy dog is needs plenty of exercise but adapts well to apartment living. 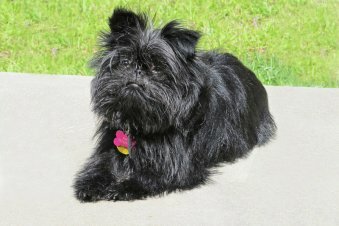 The Affenpinscher is an affectionate and loving to people and other animals. This non-shedding dog, sometimes known as the ape terrier, is an excellent companion dog but needs plenty of affection, time, and attention. Though this small dog is playful, it also has a tendency to wander and is not recommended for small children without proper training. Overall, this hypoallergenic dog breed is a great small dog for couples, or families with older children. This large hypoallergenic low shedding dog is an affectionate, energetic breed. The Afghan Hound is known for being exceptionally kid-friendly when properly socialized and endearingly playful. The beautiful Afghan Hound is not for everyone. This is a breed that requires a patience, and experienced handler who is ready to tolerate the Afghan Hound’s slowness to potty train, and it’s independent nature. Although their long, flowing, hypoallergenic coat may make for a handsome picture, it is also a hassle to groom. Grooming must be performed regularly. This large hound is a very sociable animal, and therefore doesn’t accept isolation or long periods of alone time easily. 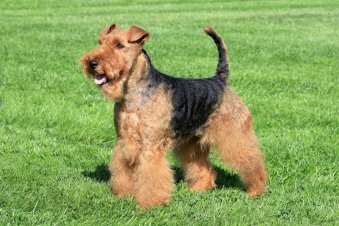 The playful Airedale Terrier is a breed that has captured the hearts of many. Sportsy and hardworking, this intelligent, high energy dog loves nothing more than to work beside a master that is capable of meeting his extensive exercise needs. The hypoallergenic Airedale Terrier is known as the King of Terriers, and is the largest breed in the Terrier group. Known for its strong prey drive, wanderlust, and its tendency to bark, this large Terrier certainly isn’t for everyone. Be careful not to over bathe this reasonably low maintenance dog. Aspiring owners of the Airedale Terrier should be aware that this dog does occasionally shed, and must absolutely have its exercise needs met on a daily basis if it is expected to behave obediently. A derivative of the rat terrier, this hypoallergenic dog is recognized as its own, distinct breed. Their long name is often abbreviated as the AHT. Much like their rat terrier cousins, this hypoallergenic, hairless dog is very intelligent and simply a joy to train. However, their extremely strong prey drive and intense need for exercise can seem overwhelming to many dog owners. This playful dog is non-shedding, of course, but is very sensitive to cold temperatures and harsh discipline. 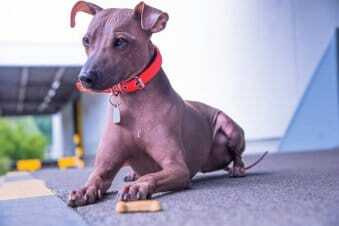 Do not expect the American Hairless Terrier to worship the ground you walk on, as this small dog is better described as stubborn than people pleasing. An active, patient individual, or an active family with older children are sure to find this exciting, playful, energetic dog to be an ideal fit. 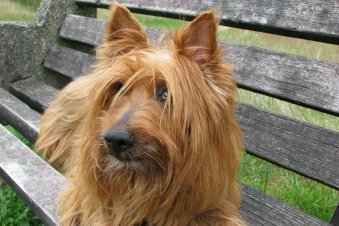 Like most Terriers, the Australian Terrier is a spunky, energetic, playful pet. Also known as the Silky Terrier, this small dog breed is hypoallergenic. In contrast to most Terriers, the Australian Terrier is actually considered to be quite easy to train. However, they do possess a deep desire to run, and a very strong prey drive. Therefore, this dog breed may not be the best candidate for those who have prey animals as pets, such as rats, or rabbits. They also require obedience training to curb their running instincts, and tendency to bark. Regular exercise is an absolute necessity to keep this beautiful, allergy-friendly dog from going stir-crazy. The Australian Silky Terrier is a small hypoallergenic dog that is non-shedding. it is bred from the Australian Terrier crossed with the Yorkshire Terrier. 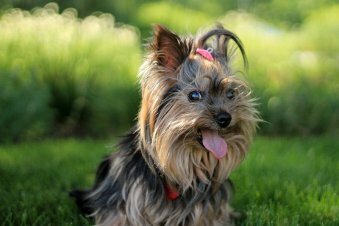 It has had a number of names, including the Silky Terrier and the Sydney Silky, but it is now officially recognized as the Australian Silky Terrier. Great for people with dog allergies. The intelligent, lively Aussiepoo is an energetic dog that ranges in size from the tiny toy version, to the large standard. This hypoallergenic designer breed is a cross between two of the most intelligent breeds of dog: The Poodle, and the Australian Shepherd. Although this breed is remarkably friendly, it can also be a challenging pet to own. The Aussiepoo, or Aussiedoodle as it is sometimes called, needs an hour of moderate to intense exercise daily, in addition to plenty of mental stimulation. Like many herding dogs, this dog likes to have a job to do. If you don’t provide one, the Aussiepoo may come up with its own job, which could be anything from stealing shoes to herding children. The Basenji is an exceedingly friendly, but quiet dog. Its hypoallergenic coat is relatively easy to maintain, requiring only occasional grooming with a hound glove. This alert, poised, beautiful medium-sized breed is very active and energetic, and requires plenty of exercise. 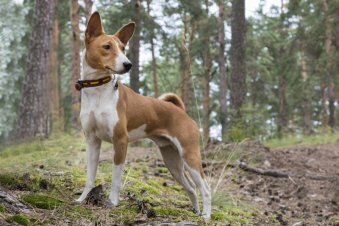 In addition to being highly inquisitive, the allergy-friendly Basenji is also very independent, has a strong prey drive, and may tend to run away if under exercised or undisciplined. Due to it’s wanderlust, this dog breed requires early and frequent obedience training. With proper socialization and adequate supervision, the Basenji is a great candidate for homes with energetic kids and family members. This beautiful hypoallergenic Terrier is a medium breed of dog that is exceptionally friendly. Due to their amiable natures, they make excellent pets for families with children, and they are great with strangers as well. 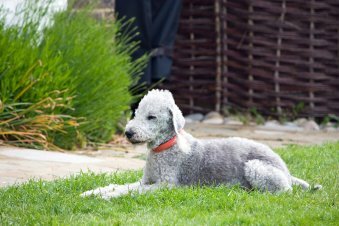 Unlike other Terriers, the Bedlington Terrier is reasonably resistant to temperatures, and is not a constant barker. Though they are a fairly easy pet, they can be a bit more challenging for a novice owner to train than other dog breeds, and their grooming needs can be considered tedious. This medium-sized Terrier is a high energy breed with a strong prey drive. Be sure to exercise this dog regularly, and avoid exposing it to small prey animals. The charming, playful Bichon Frise is a curious, spunky pup. Though they are active animals, their playfulness is expressed in short bursts of energy and easily gives way to calm cuddle sessions. This small, hypoallergenic dog breed is great with children and other dogs. This small, non-sporting breed rarely sheds, but its coat does require daily grooming. Due to their medium level, well balanced energy, and their overt friendliness, this dog is a good candidate for apartment living. However, leaving the Bichon Frise alone in an apartment all day could be a recipe for disaster! Like many small dogs, the Bichon may suffer separation anxiety. As they are very intelligent, and respond well to training, novice owners will find this breed a treat to raise, so long as they provide it with proper mental stimulation. Like most Terriers, the Border Terrier is an energetic, prey-driven dog breed that is hypoallergenic, but difficult to train due to their stubborn nature. In spite of that, the Border Terrier is an affectionate pet with an enormous amount of personality. This Terrier is not quite as aloof as others in the Terrier class and tends to be affectionate with family, children, and even strangers. Due to its strong prey drive, and high energy levels, this dog requires a good deal of training and regular, disciplined exercise. Barking should be discouraged from an early age. The Border Terrier is a small dog breed that is sensitive emotionally, and also sensitive to cold weather. Other Names: Toucheur de Boeuf (Cattle Driver), Vlaamse Koehond (Flemish Cow Dog), and Vuilbaard (Dirty Beard). 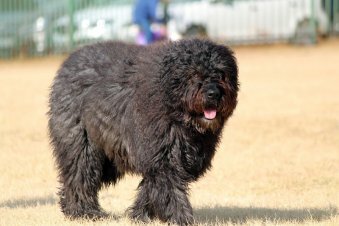 The unusual bear-like Bouvier Des Flandres is a spectacle of a dog. Their strong-willed nature and courage seem like expected traits when paired with this dog’s intimidating stature and calm demeanor. This fierce appearance was a useful attribute for the breed, which was bred to protect flocks of sheep by scaring wolves away – often on mere appearance alone. The Bouvier is hypoallergenic, and very intelligent. Unlike other large dog breeds, this dog drools very little and is low shedding. Due to it’s smarts, the Bouvier Des Flandres is easy to train, but functions best when given a job to do. Prospective owners should be aware that this breed ranges from 70-100 lbs when full grown, and may not be appropriate for children or smaller adults if improperly trained. The tiny Brussels Griffon is best described as a lot of dog in a small package. Curious and loyal, this alert pup makes for a spunky, playful companion. Supervision is recommended for this breed when socializing with children or other dogs, but they are generally cat-friendly. This small, hypoallergenic dog is wonderfully adaptable to apartment living and makes for an excellent watch dog. 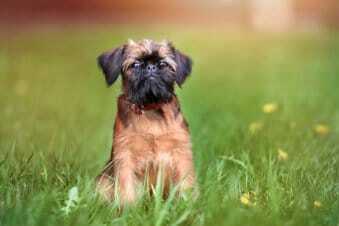 Though the Brussels Griffon is highly intelligent, they may not be the easiest dog to train. Due to their independence, and their great need for companionship, it’s important to start training and socialization early with this breed in order to have a happy, well-adjusted and lovable pet. The courageous, tenacious Cairn Terrier is an all around friendly dog. Hypoallergenic and easy to groom, the Cairn Terrier is also more resistant to cold temperatures than most Terriers are. However, like most Terriers, this small dog also has a very high level of energy and requires a master that is willing to incorporate discipline and regular exercise into their lifestyle. Cairn Terriers have a strong drive to hunt, so they are not necessarily appropriate pets for those owners that also own prey animals such as mice. It is important to restrict this small dog’s diet to avoid excessive weight gain, as this is a Terrier that loves to eat. 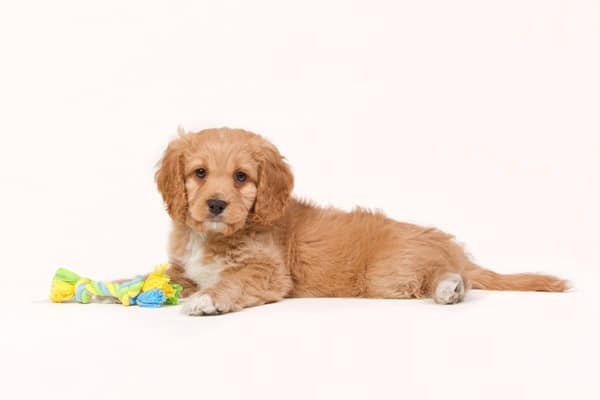 The Cavapoo, also known as Cavoodle, is a cross between a miniature or toy poodle and a Cavalier King Charles Spaniel. In Australia in the late 1990s, this breed became highly popular with crossbreeding programs. The Cavoodle, soon became one of the most popular breeds in Australia. Cavapoos are highly intelligent, friendly, gentle, and affectionate. They love spending time with their family and even get along with other pets. This breed’s playful nature lends to their lovable and adorable demeanor. This small hypoallergenic dog is quite unusual as far as Terriers are concerned. The Cesky Terrier is less inclined to bark, wander, or chase prey than a typical Terrier. Likewise, the energy levels and exercise needs of this breed are a bit lower than the average Terrier, but they are still incredibly playful. As a more calm breed of small dog, the Cesky Terrier is highly adaptable to apartment life. While it may be more challenging to train than other dogs, this charming pup makes a wonderfully loyal and cuddly companion. This breed is best described as a medium energy dog which comes in various shades of grey. This unusual dog is the iconic symbol of hairless breeds. Not only does the hypoallergenic Chinese Crested dog have a distinct appearance – it’s temperament is unusual as well. This slim, elegant small dog is cat-like in personality. 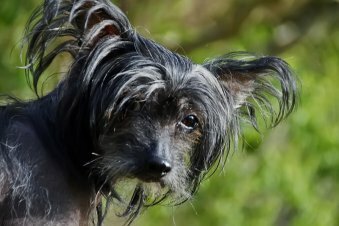 Though lively and affectionate with family members, the Chinese Crested is known to turn a cold shoulder to strangers. Like many small dogs, this breed absolutely requires attention and socialization. Therefore, this dog isn’t the best candidate for those households that are typically empty from 9 to 5. Owners of this breed may choose to hire a dog walker to satisfy this pup’s desire for socialization, and its need for a short but brisk daily walk. 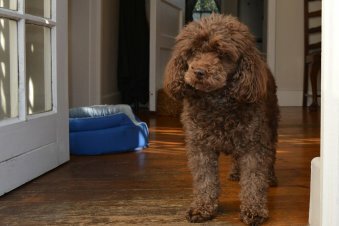 The sweet, loveable Cockapoo is a relatively old designer breed that has captured the hearts of dog lovers everywhere. This breed is a cross between a Cocker Spaniel, and a miniature or toy Poodle. Cockapoos are bright, cheerful dogs with a shaggy coat and a charming face with dark, soulful eyes. These adorable pups are incredibly affectionate, intelligent, and easy to train due to their people pleasing nature. They are excellent for novice dog owners and amazing pets for families with children and other dogs. Due to its inherited Poodle hair, the Cockapoo is a generally odorless dog that is hypoallergenic, and low to no shedding. Some might say the Coton De Tulear missed it’s calling in life – it was meant to be born as a stuffed animal! This adorable happy-go-lucky pup is born to soak up your love, and is known to follow favorite family members around the house. 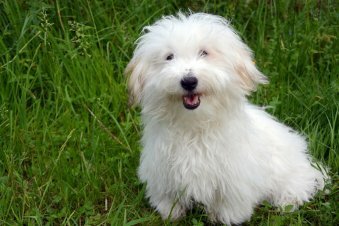 Small and hypoallergenic, the charming Coton De Tulear (co-tone de too-lee-are) is great with children and other dogs, and responds well to training. Though they are an active breed, this dog is not quite as energetic as other breeds, and so it is adaptable to apartment living so long as it is not left alone for too long. Though this little dog rarely sheds, weekly grooming is recommended. The super friendly Goldendoodle is a loveable, highly energetic pet. This designer dog breed is a cross between a Golden Retriever and a Poodle. 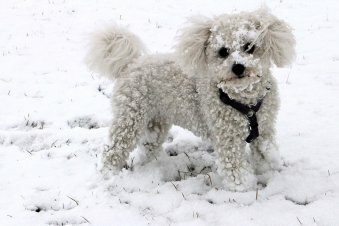 Due to the Poodle’s hair coat, this dog is hypoallergenic, low shedding, and generally odorless. Athletic people will enjoy the Goldendoodle’s boundless energy. This large dog breed is very people pleasing, intelligent, and easy to train. However, they require plenty of exercise, and are not suitable as apartment pets. Much like the Golden Retriever, the Goldendoodle is an excellent candidate for families with children and they flourish in multiple dog households. With the proper time commitment, this large, allergy friendly pooch makes for a playful, happy-go-lucky pet. 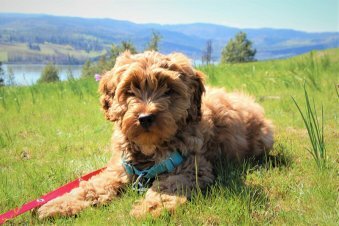 Read more – Are Goldendoodles Hypoallergenic Dogs? Meet Dexter, the hypoallergenic Goldendoodle. 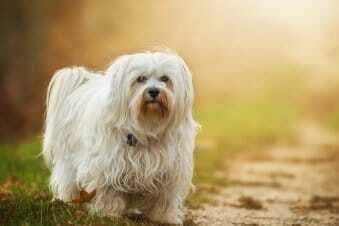 The toy-type Havanese breed is a great pet for novice owners. This eager to please pup is highly intelligent and a treat to train. Their medium energy level is easier to manage than other breeds of dog, and their curious, highly sociable nature makes for a lovely walk. 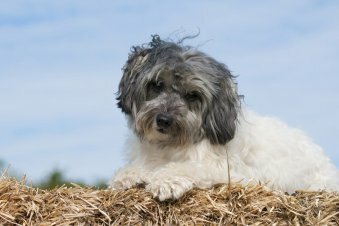 Though socialization with other dogs should be supervised, the Havanese is a great candidate for families with children. Their low shedding hypoallergenic coat makes this breed a wonderful option for fastidious people, or those with dog allergies. Despite this breed’s extremely affectionate disposition, owners should be wary of it’s high prey drive. Smaller, prey-type pets should be well secured, and leashed walks are highly recommended. The highly energetic and super affectionate Irish Terrier has a personality best described as magnetic. Hypoallergenic, intelligent, and great with children, this dog is an excellent choice for very active families. 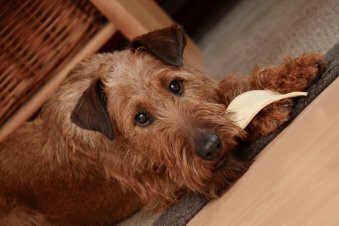 Despite the intelligence of this breed, the Irish Terrier can be difficult to train. Like many Terriers, this breed requires plenty of exercise. However, as a medium sized dog, it requires longer durations of exercise than most of the small sized Terriers. Experienced handlers will enjoy this dog’s enthusiasm for work and play alike. However, owners who are busy or inattentive may be disappointed with the Irish Terrier’s destructive tendencies when left to their own devices. This hard-working, sporty spaniel is a great dog for athletic types. 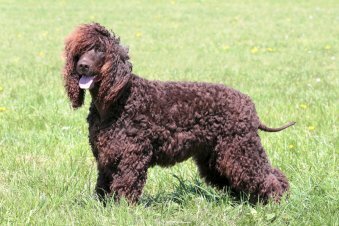 Weather resistant and eager to please, the hypoallergenic Irish Water Spaniel is alert, inquisitive, playful, and brave. Though they only shed seasonally, occasional grooming is still recommended – especially for those Water Spaniels who can expect to spend a lot of time enjoying the great outdoors. Predictably, this water retriever is a very strong swimmer who loves to play fetch. However, beware of this dog’s strong prey drive while playing without being leashed. Though they are very, very friendly dogs, interactions with other dogs and with children should be supervised with this bold breed. 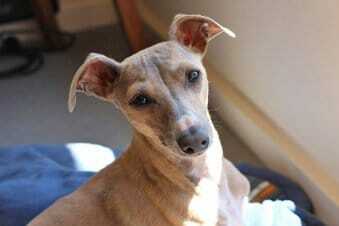 The Italian Greyhound is a svelte, docile companion. These dogs are an exceptionally healthy breed that is low maintenance and thrives in compact living spaces, such as apartments. 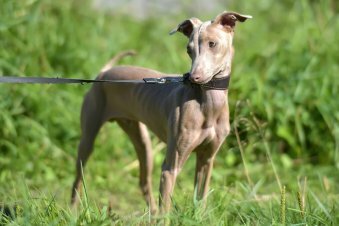 Most would expect that the Italian Greyhound’s deepest desire is the thrill of racing, however, they are more notorious for their extreme attachment and devotion to their owners. These dogs crave the affection and attention of their people above all else! The Italian Greyhound is an expressive, naturally tidy dog that drools very little and is considered to be non-shedding. This medium sized Terrier has several characteristics that set it apart from other dogs in the Terrier class. 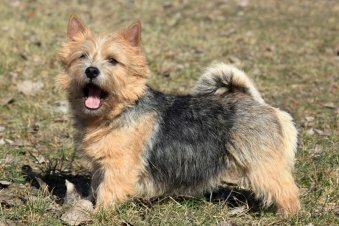 Though this breed is alert and lively, they are less hyperactive than most Terriers. The Kerry Blue is an excellent candidate for fastidious owners, or those that suffer from dog allergies, due to its low amount of shedding and its hypoallergenic coat. This medium sized Terrier generally does not excessively bark, however, it is not the best breed for multiple dog households, our households with small children. This terrier is known to be stubborn in training, and requires a master who is willing to be patient, calm, and above all, loving. The lovable Labradoodle is a fairly recent breed that has captured the hearts of many. This designer dog is a mix breed, combining a Labrador and a Poodle. Its extremely affectionate disposition and people-pleasing nature are some of its excellent traits that are mostly inherited from the loving, goofy Labrador. However, the Poodle in this breed really helps make its intellect shine and tone down the barking. Both Poodles and Labradors are very energetic, weather resistant, playful breeds that are generally appropriate for new dog owners. Yet the real beauty of this crossbreed comes from the Poodle’s hypoallergenic, low-shedding coat, which is inherited with varying degrees in the Labrador. Those who love labs, but suffer from dog allergies, are sure to love the Labradoodle! 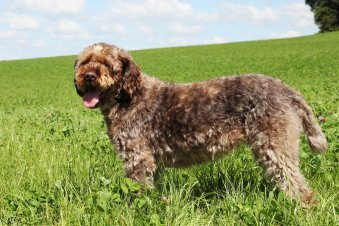 The medium sized Lagotto Romagnolo (La-got-o Rome-ag-no-lo), is a rare, but charming breed. The origins of this working breed hark back to Italy, where they were bred as water retrievers. However, as their working usefulness became more and more obsolete due to developing technology, the breed’s popularity suffered, and it is still a rare dog to this day. This is an easy dog to keep if you’re willing to provide it with plenty of affection and quality time. The Lagotto Romagnolo is known to suffer separation anxiety. These dogs are naturally obedient and eager to please. 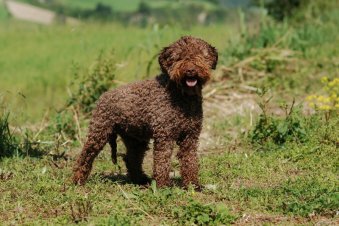 Their hypoallergenic coat is low shedding and requires only occasional grooming, and although their temperament is upbeat, the Lagotto Romagnolo is not a hyper breed. 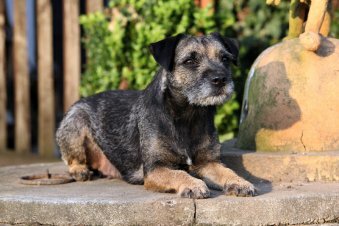 Other Names: Cumberland Terrier, Patterdale Terrier, Fell Terrier, Westmorland Terrier and the Colored Working Terrier, and it is nicknamed the Lakie. Those who fall in love with the Lakeland Terrier do so for good reason. Affectionate, zesty, and full of energy, this intelligent dog is a wonderful companion for handlers that lead an active lifestyle. This small Terrier is hypoallergenic, so it is an excellent option for those who suffer from dog allergies. Despite its intense energy level, this breed barks less, and responds to training better than most Terriers. Interactions with small children and dogs should be supervised. Though Lakies have a lovely, bright personality, they are known for escaping backyards and require plenty of exercise, and a formidable fence. 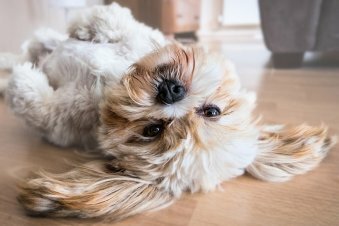 The lovable and popular Lhasa Apso is a fun-loving class clown. This small dog’s iconic flowing coat is hypoallergenic and requires regular grooming, or a lower maintenance cut. 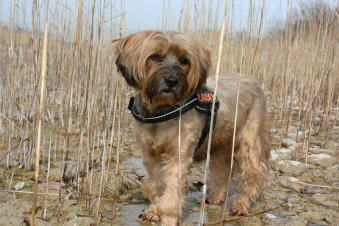 Though they are generally good choices for inexperienced owners, the Lhasa is fairly independent, so early and frequent training is recommended. Though this little dog is very affectionate towards cats, dogs, and kids, it is also brave and may be aloof with strangers. Due to its small stature, children must play gently with this breed and supervision is recommended. Not fearful, but rather cautious, this pup is sure to raise the alarm at any hint of trouble. Like other small dogs, the Lhasa Apso has a medium level of energy, and is well suited to apartment living. The Lowchen is an ancient breed that is easily recognized in artwork by its distinctive “Lion cut” hypoallergenic coat, which dates back to the 1400’s. Sturdy and intelligent, the happy, alert Lowchen is an all-around well-balanced, highly adaptable pet. This breed is well known for its bravery, and refusal to back down. Though they make excellent apartment pets, the Lowchen is also a wonderful, albeit territorial watchdog. This small dog is highly affectionate, but surprisingly, it tends to get along better with cats than other dogs. Their hypoallergenic coat is low shedding, and their intelligence and trainability make them an easier, less time-consuming breed to own. Still, the Lowchen has modest exercise needs and will always benefit from a daily walk. Other Names: Maltese Terrier, Maltese Lion Dog, Ancient Dog of Malta, Roman Ladies’ Dog, Malti Dog. Who can resist this sweet face? The charming little Maltese is a popular pet among toy-dog lovers. 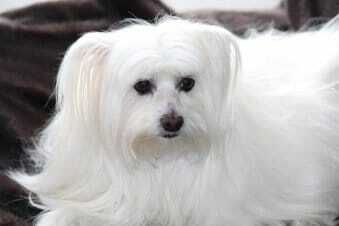 A classic lapdog, the Maltese is somewhat active, but very friendly, gentle, and playful. Children should be careful with this fragile dog and play with other dogs should be supervised. Their beautifully long, flowing white locks are hypoallergenic and low shedding, but require regular grooming. For those looking to cut back on the time commitment of maintaining this breed’s typical hairstyle, other, more low-maintenance cuts are available. These dogs are great candidates for first time dog owners due to their trainability and intelligence. They thrive in apartments, but they require frequent affection. Possibly the cutest dog breed ever devised, the Maltipoo is an adorable designer crossbreed that is bred from a Maltese and a toy or miniature poodle. Due to its Poodle genes, the Maltipoo’s fluffy, scruffy coat is hypoallergenic and low shedding. 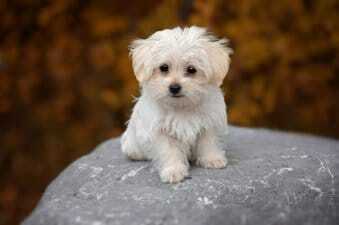 Maltipoos come in a variety of colors with white being the most popular. They have dark, intelligent, button eyes. These dogs are people pleasing, highly intelligent, and easy to train. Though they adapt well to apartment living, they need plenty of time to do what they do best – cuddle the people they love. This adorable ball of fluff is an excellent candidate for new dog owners and an exceptional companion dog. This small dog is a captivating breed to work with. Fiery, and energetic, the Miniature Bull Terrier is a comical class clown that loves to play, and absolutely needs to run. Those who are considering buying this breed should be aware of its adventurous, mischievous nature. 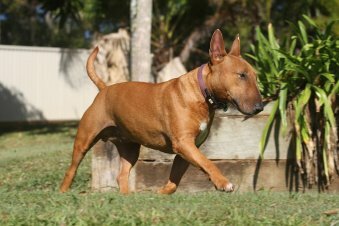 The Miniature Bull Terrier is a highly independent, often assertive dog that can be difficult for a novice owner to train. 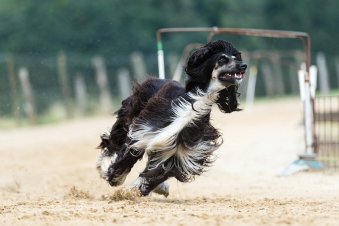 This breed is an excellent candidate for dog sports and runners, but not the best choice for families with small children. However, the Miniature Bull Terrier does in fact make an excellent watch dog, as they have a tendency to be quite protective. Adorably lovable, this tiny hypoallergenic dog bursts with energy and enthusiasm. This sweet, small terrier is more sociable than a typical terrier, and good with children. Though this breed is relatively easy to train, it does require quite a lot of exercise. These dogs are curious but often cautious with strangers, so they may require more socialization that other breeds. Excellent as a watch dog, this low shedding breed is a pleasurable pet for those who are prepared to deal with it’s terrier temperament. 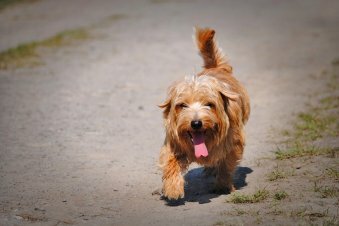 The Norfolk Terrier sets itself apart from other dogs in the terrier group due to its amazing adaptability and readiness to learn obedience. Therefore, this is a great pet for handlers with less experience that are looking to take in a bit of that terrier spirit for themselves. The small and foxy Norwich terrier is one of the smallest breeds of working terriers. Hypoallergenic and tirelessly active, these playful dogs are good with children, and do not bark excessively. This small terrier is relatively easy to train, but its curiosity and boundless energy require a household that is active and attentive. Their strong prey drive and wanderlust is best curbed through regular exercise and play. The Norwich terrier is a generally healthy breed that requires mental stimulation, as well as physical exercise, and regular weekly grooming. Like many terriers, this dog is a loving pet, but does not adapt well to long periods of isolation. The lovely Peruvian Inca Orchid was rumored to have been a prized Incan pet. It is said that these dogs were kept indoors among orchid petals during the day, and only allowed out at night, so as to keep their skin from becoming sunburnt. Today, this breed is rare, but charming. Their highly adaptable, affectionate nature makes them dog-friendly and well adjusted to apartment living. These dogs are typically calm and will usually become couch potatoes indoors. Because they are highly sensitive, they respond best to positive reinforcement. Like other hairless breeds, care should be taken not to overexpose the Peruvian Inca Orchid to sunlight. The poodle is a well-known, well-loved dog breed. Their curly, Hypoallergenic coat of hair has gained fame due to the unusual style in which it is often cut. In addition to their fancy coat, Poodles are famous for their prim demeanor and poise. This dog is no brainless beauty. In fact, they are hailed as one of the smartest dog breeds, second only to border collies. This breed comes in a range of sizes from the tiny toy variety to the large standard. 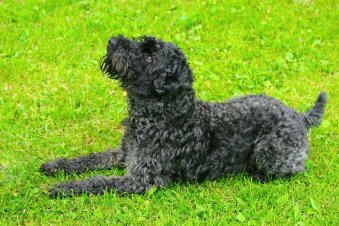 Due to their non-shedding coats and their versatile build and temperament, poodles are often used to breed new designer dog breeds such as the Labradoodle, the Cockapoo, the Maltipoo, and the Aussiepoo. Despite their popularity, Poodles and most of their mixes aren’t the best choice for some households. These highly intelligent, active dogs require plenty of physical and mental exercise, as well as constant grooming. Often described as being similar to Poodles, this medium sized dog is hypoallergenic and highly intelligent. 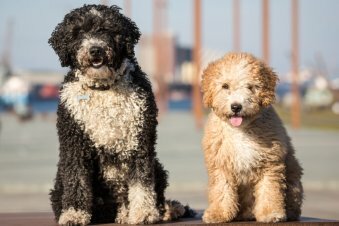 Due to the breed’s near extinction in the 20th century, the Portuguese Water Dog is still a difficult dog to find breeders for. This medium sized breed recently gained notoriety as the choice pet of the United States president, Barack Obama. 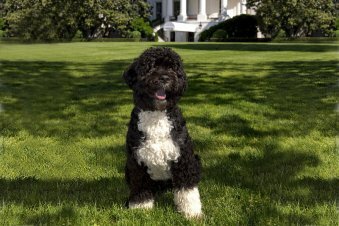 Historically, the Portuguese Water Dog was bred to herd fish into fishing nets, collect gear that had fallen overboard, and swim to other ships or to land to deliver messages. This sea faring pooch is very affectionate and quite easy to train. Though they hardly ever drool and are considered a non-shedding dog, they require long exercise sessions, training, and mental stimulation, and may become destructive when bored. This headstrong working breed is best suited to people who are invested in having an active lifestyle. Their thick, tightly curled, hypoallergenic coat naturally matts together to form cords that are similar in appearance to dreadlocks. Despite this, the Puli needs daily grooming to maintain a clean, healthy coat. Very energetic and playful, this medium sized breed is not suitable to apartment living without extensive exercise. Due to their protective nature, this dog makes an excellent guard dog, but is often shy with strangers. 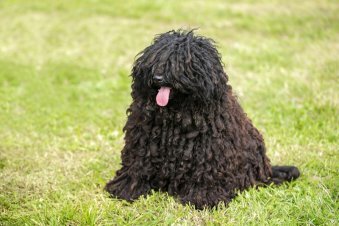 The Puli is relatively easy to train, and is an excellent candidate for dog sports such as agility, obedience, showing and more. Read more about Hypoallergenic Pulik here. 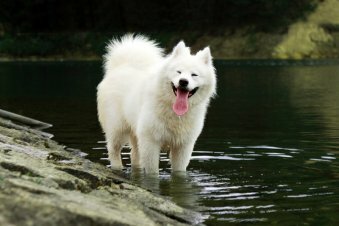 The spitz-type Samoyed is an iconic dog with a large, white, and beautiful hypoallergenic coat. It is important to note that this breed is not low shedding. The Samoyed can be expected to shed its massive coat twice a year, resulting in mounds of hair. It gains its hypoallergenic status by being low dander and low drool, and through having proteins that tend to cause less allergic reactions than other breeds. It is important, therefore, that the Samoyed is thoroughly brushed daily, which should help to reduce the effect of their regular shedding. This unusual dog was originally bred to herd reindeer and pull sleds, and it retains its herding instincts to this day. This breed also has a strong prey drive and a tendency to run away. Highly energetic and exceptionally friendly, this large, robust dog is an excellent choice for families with children. Despite their tendency to bark at perceived threats, the playful Samoyed makes a poor guard dog due to its amiable nature. Other Names: Little Beard, Zwergschnauzer (German: Dwarf Schnauzer). A versatile breed that comes in three different sizes, the hypoallergenic Schnauzer is a loyal protector and a loving pet. Though it is technically a Terrier, this rat hunter is much more laid back and less predatory than other Terriers. 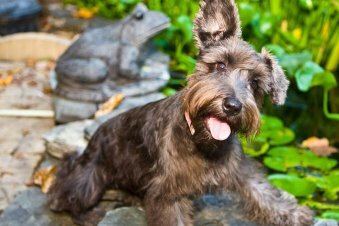 Due to their similarities in appearance, Schnauzers are often mistaken for Scottish Terriers. This dog has a rich history and was once used as a message carrier during wartime. The allergy-friendly Schnauzer breed is well known for its distinctive snout hair. While there is not much of a difference in temperament between the sizes, larger Schnauzers require more exercise while the smaller Schnauzer is less adaptable to being left alone. The hypoallergenic Scottish Terrier is easily recognized by its striking silhouette, which has gained fame with dog lovers everywhere. This dog’s unusual facial features and dark, intelligent eyes has endeared it to many. In addition to a handsome face, this dog possesses an innate sense of dignity and independence. Unlike other terriers, the hypoallergenic Scottish Terrier is a medium energy dog, which responds well to training, and is good with children. Small, compact, and tough, the Scottie is truly a charming companion. Be sure to be prepared to engage these dogs mentally, start socialization early, and practice obedience regularly if you are looking to bring a Scottish Terrier into your home. Also known as the Welsh Border Terrier or the Cowley Terrier, this robust small dog is proud and independent. Though they exhibit less energy than most terriers, this breed still has a remarkably strong prey drive and can be feisty with other dogs. 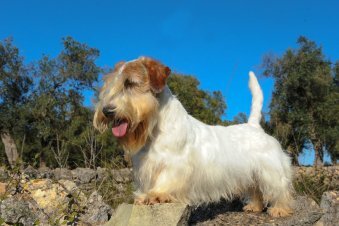 The Sealyham Terrier’s floppy ears and regal appearance are endearing, though the traditional coat shown in show dogs of this breed takes a great deal of knowledge and time to maintain. Strong-willed, resilient, and driven, this breed is not recommended for people that aren’t willing to commit the time and patience that is necessary to build an obedient bond of trust and mutual respect. 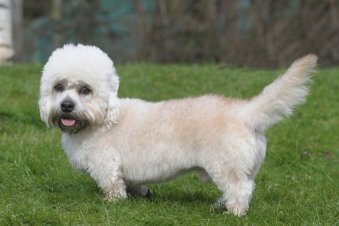 Brave and loyal, this small hypoallergenic breed is a wonderful companion, and an excellent pet for the elderly. Though this dog excels as a watch dog, it is also an affectionate pet that is friendly with strangers, as well as other dogs and children. The Shih Tzu sheds infrequently, however, its beautiful hair coat needs plenty of grooming and upkeep. Playful and easily trained, this companion dog is an excellent family pet that adjusts well to apartment living. 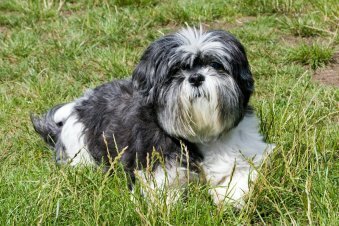 The Shih Tzu is a good choice for novice owners that are looking for a small dog breed that is playful, alert, and allergy friendly. This fun-loving, medium sized terrier is a calmer, less intense option for those that are passionate about the terrier dog group. Sometimes called the “Wheatie” this non-shedding, hypoallergenic dog is a loveable goofball with puppy-like tendencies and a ton of personality. The Wheaten Terrier is eager to please, but despite its rowdy nature, it does not have quite the same intensity that other terriers are well known for. Though this medium sized dog breed is eager to please and very friendly, interactions with small kids should be supervised. This dog is known to have destructive tendencies and separation anxiety if left alone and unstimulated. The affectionate, intelligent Spanish Water Dog is a devoted working companion. Active and easy to train, this hypoallergenic breed is a highly versatile breed. Surprisingly enough, the Spanish Water Dog isn’t actually a water dog at all; it is actually a member of the herding group. Despite its obedience, this dog requires extensive exercise and plenty of quality time with its owners. The Spanish Water Dog makes for an excellent watch dog due to its territorial nature and willingness to guard the homestead. Due to these abilities, this medium sized breed needs early and consistent socialization to be well behaved and well adjusted. The picturesque Tibetan Terrier is an unusual terrier indeed! It’s flat, show-shoe like feet are a product of selective breeding, which made it better able to cope with the snowy, mountainous terrain of Tibet. When regularly groomed, this terrier (also known as the Lhasa terrier), has beautifully flowing locks of hypoallergenic hair. However, like most breeds with long hair, the Tibetan Terrier requires consistent grooming. This is a very active dog. Their personality and affection makes this medium sized terrier a lovable, loyal pet. Unlike other, more fragile terriers, the Tibetan Terrier is a sturdy breed that is great for families with kids! However, despite all of its wonderful qualities, this dog has an independent nature that requires a patient, dedicated trainer. 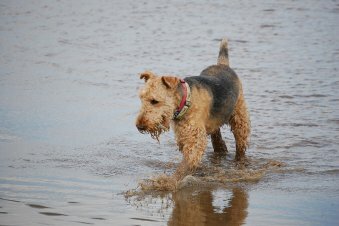 The Welsh Terrier is a small, hypoallergenic terrier that sheds seasonally and requires grooming only about once a week. This terrier possesses a handsome stature with longer legs than many other dogs in the terrier group, which make it a better candidate for dog sports. Despite it’s non-hyper demeanor, this dog is still quite spirited and requires a moderate amount of exercise. 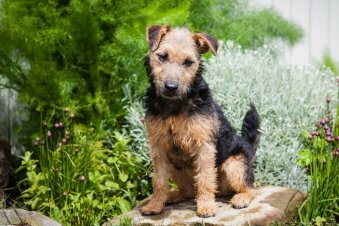 While many other terriers may be too rowdy, or too fragile for young children, the Welsh Terrier is a hardy breed, and a friendly, protective family pet. Beware of some of it’s more typical terrier traits however. This medium sized terrier has a strong prey drive that may lead to aggression towards other pets. This breed may be possessive over food or toys if not properly trained, and if left alone and unstimulated, it may become destructive. Exceptionally playful, curious, and active, this typical terrier makes for a rambunctious pet. 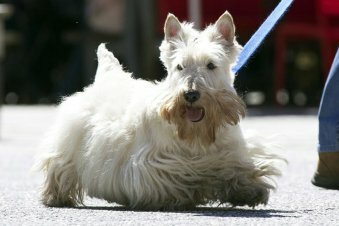 Hypoallergenic and low shedding, the West Highland White Terrier, better known as the westie, is a smart, friendly breed. Though the Westie is a small breed of dog, it requires a good deal of exercise. Like many terriers, this dog possesses a large amount of energy and a very high prey drive, which may cause it to develop undesirable habits if left under-exercised. 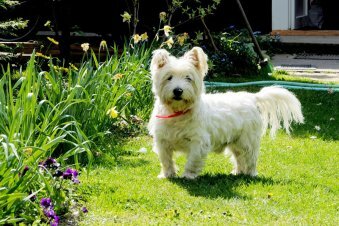 This dog’s adorable looks and overt friendliness are charming enough by themselves, but the Westie is also a very intelligent, easily trained dog. 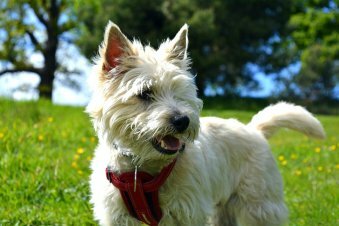 While some terriers aren’t the best for families, the West Highland Terrier is an excellent choice for kids. With a relatively low maintenance, hypoallergenic coat that requires only weekly grooming, this dog is an excellent choice for active owners that suffer from allergies. The Wire Fox terrier is the epitome of the terrier personality. Energetic and extremely playful with a formidable prey drive, this intelligent, trainable dog is the embodiment of all things terrier. Don’t be tempted to try this breed if you aren’t willing to commit at least an hour of exercise and mentally challenging games towards keeping this breed fulfilled and well-mannered. 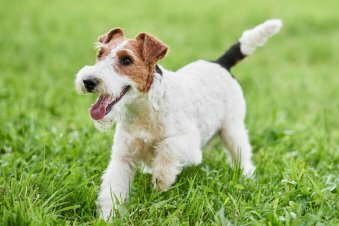 The Wire Fox Terrier is an excellent choice for those with ample fenced in property, or owners that are looking for a dog that will engage in activities. The “Wires”, as they’re sometimes called, are very alert and confident, and therefore make excellent guard dogs. However, if this breed is not socialized properly, and from an early age, its instinctual nature may result in aggressive play with other pets. These tireless, active dogs are outgoing and eager. While they are highly intelligent and easy to train, this breed does not adapt well to a slower paced lifestyle or long periods of alone time. This dog’s hypoallergenic hair coat is low shedding but requires regular grooming. Despite their poor adaptability towards apartment living or low exercise households, the Wirehaired Pointing Griffon is an excellent dog for families – especially those with active children. Playful, energetic, intelligent, and highly trainable, this breed is an excellent choice for those seeking a loyal working companion, or for those who suffer from dog allergies. 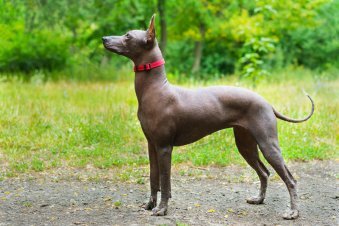 Also known by the nickname “Mexican Hairless Dog”, this versatile breed of dog comes in sizes ranging from 10-50 lbs. Although they are commonly regarded as hairless, they are sometimes born with hair due to a recessive gene inherited from the breed’s origins. This breed is quite affectionate to animals and children alike and it’s generally regarded as a companionable family dog. However, as with all hairless breeds, certain care must be taken to maintain the health of this dog’s skin. Dog safe sunscreen is a necessity for long periods of sunlight exposure and owners should take care not to over bathe this breed. The tiny Yorkshire Terrier, better known as the Yorkie, is a terrier that has captured the hearts of dog lovers everywhere. Affectionate, but impish, this tiny pooch is shockingly personable and very affectionate. Despite its small size, the Yorkie is still a decently healthy breed, although it’s long, hypoallergenic coat can be tedious to maintain. 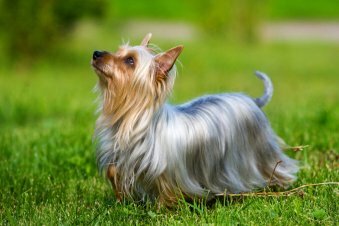 Like other long-haired breeds, the Yorkie’s traditional coat takes a lot of maintenance, especially if exposed to heavily wooded areas, or other messy opportunities. The Yorkshire Terrier makes an excellent apartment companion. Due to its toy size, this breed’s energy needs are easily satisfied with a brisk half hour daily walk. Though they are loving and bold, this toy breed is delicate, and therefore it may not be suitable for houses with small children. Remember that dogs are a long-term commitment. Dogs need constant training when they are young, lots of love and exercise throughout their life, and you will need to budget extra money and time for their care … but in return they are a delight to have around (most of the time! ), joyful and enthusiastic family members, and loving and faithful companions. Combine these qualities with a low dander dog, that doesn’t shed much and you have the perfect hypoallergenic pet! So if you are looking for the perfect non-shedding, non-allergenic dog for your needs, I hope you will find some inspiration from this list of 50+ hypoallergenic dogs.